I have been following "Can't Hold My Lacquer" on Facebook as well as their blog. Michelle & Karen are sisters who created Tipsy Turvy Nails and have a store on Etsy. They recently asked bloggers on Facebook to contact them if they would like to review one of their polishes. I took a look at their Etsy site and thought their polishes looked beautiful, so I contacted them. A week or so later, I received Astral Azure in the mail. 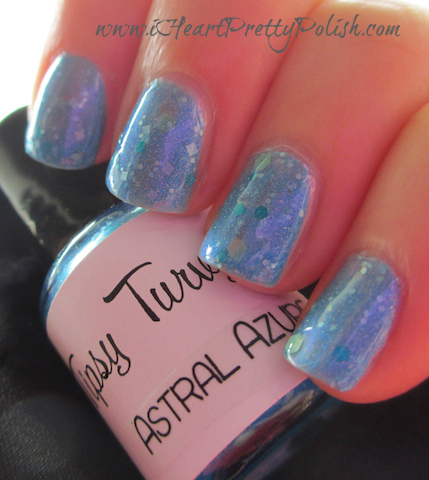 The Tipsy Turvy team describes Astral Azure as a polish made up of cerulean mica, and an ocean mix of glitter which has different shades of blue and green, hex and square. There is also a little holographic pizazz. The base for this look is a sheer white Julep polish. This was one of the first Julep polishes I received and I wasn't aware that they had the name on the UPC symbol that I tore off right away from the side of the bottle. This means that I have no idea which polish it is:( But it's a very sheer white/silvery shade. I then applied two coats of Astral Azure. If you prefer a light and subtle glitter look rather than a "glitter bomb", this would be a great choice for you. 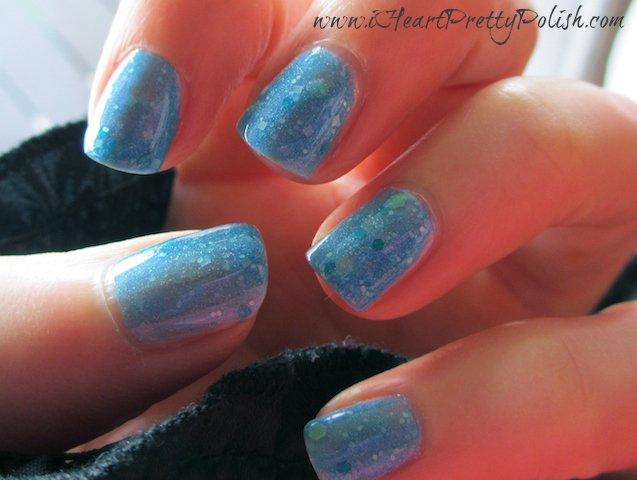 The holographic shimmer looks really pretty in the sun and being a blue nail polish fan, I really enjoyed this polish. Feel free to check out their Etsy site, Facebook, and their blog for more information about this and other beautiful polishes. I wish them luck! That is such a beautiful blue! I love it! Yes, it's very pretty! Thanks for stopping by. Super pretty! I love how much it glows. I've never heard of them and am heading to their store to check them out - thanks for sharing! This is gorgeous! Love the shimmer it has. Yes, it's really pretty. I wish I could have captured the holographic part of it better. Wow, that's a really beautiful polish!! Yes, it's really pretty and I am pleased with it. Wow, so delicate and pretty! yes, I really enjoyed wearing it. I really like this. The glitters are a nicely muted in the polish and almost look like raindrops on your fingers. Very pretty! This is very pretty, you definitely highlighted the polish with your swatches, definitely one I'm putting on my wishlist!